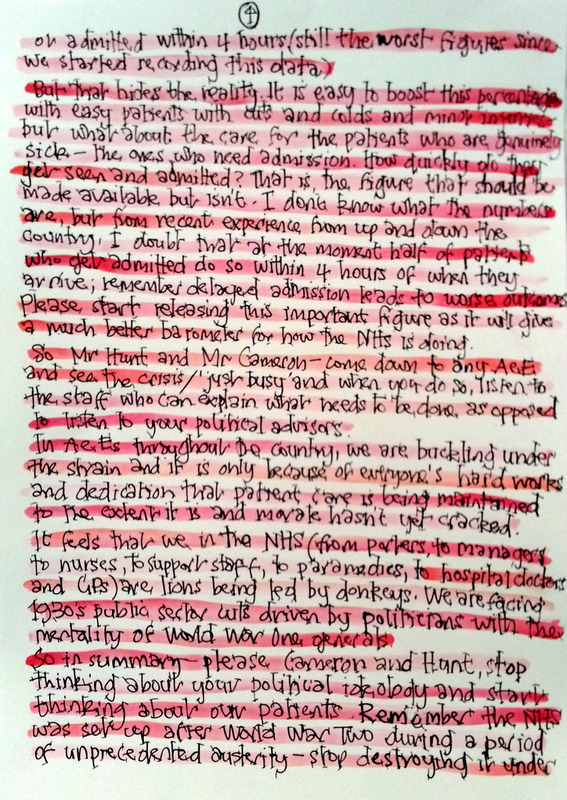 Dear Dave and Nick...: Letter 137: What happens when ideology & self interest are put before patients? An A&E crisis of course. 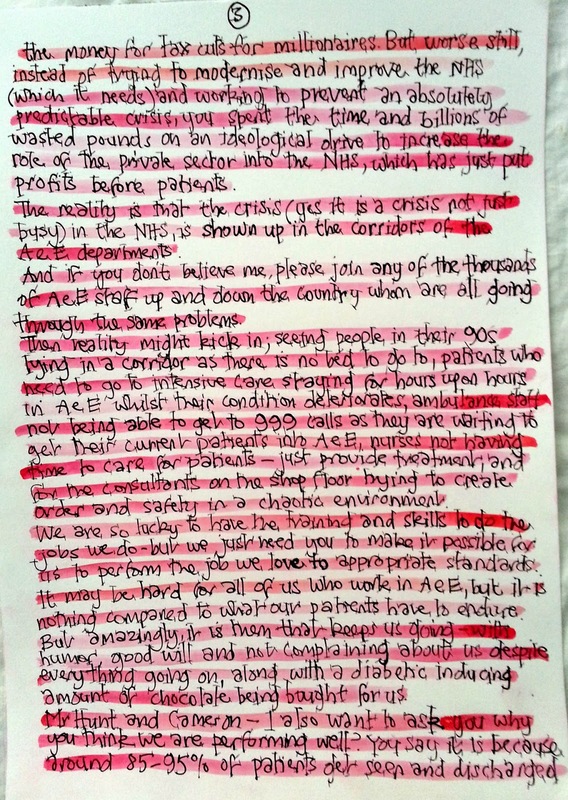 Letter 137: What happens when ideology & self interest are put before patients? An A&E crisis of course. As someone who works in A&E, I hear with interest that you have sad that things in A&E are just busy and we are performing well and not in a crisis. I though would disagree. Maybe it is just your sense of reality, which has made you say this or perhaps a lack of comprehension of the words busy V crisis. Is it not a crisis that up and down the country thousands and thousands of patients are being looked after in corridors because there are no free cubicles for them to be seen in? Is it not a crisis that many hospitals are declaring major incidents ( to just cope with normal winter pressures) and some are having tents built in their car parks? Is it not a crisis that patients who need discharging from hospital can't because social services can't cope with the demand? This mean there are no free beds for the patient to go to and so they stay in A&E for hours upon hours. Is it not a crisis when thousands of patients are having their operations cancelled because there are no beds for them to get into? Is it not a crisis when everyday A&E staff up and down the country think it is a good shift if we get a cup of tea, no member of staff is in tears and no-one dies in the corridor on our watch? ( As opposed to deliver the standard and dignity of care we wish). Or are you saying it is not a crisis because you don't want to admit the real problem and you are a tad embarrassed by your mistakes? Because when you came to power you promised to invest in the NHS and not reorganise it. But actually you lied. Health and social care are inextricably linked and you stripped money away from social care whilst still finding the money for tax cuts for millionaires. But worse still, instead of trying to modernise and improve the NHS ( which it needs) and working to prevent an absolutely predictable crisis, you spent the time and billions of wasted pounds on an ideological drive to increase the role of the private sector in the NHS, which has just put profits before patients. The reality is that the crisis ( yes it is a crisis not just busy) in the NHS, is shown in the corridors of the A&E departments. And if you don't believe me, please join the thousands of A&E staff up and down the country whom are all going through the same problems. Then reality might kick in; seeing people in their 90s lying in a corridor as there is no bed to go to, patients who need to go to intensive care staying for hours upon hours in A&E whilst their condition deteriorates, ambulance staff not being able to get to 999 calls because they are waiting to get their current patients into A&E, nurses not having time to care for patients - just provide treatment, and for consultants on the shop floor trying to create order and safety in a chaotic environment. We are so lucky to have the training and skills to do the job - but we just need you to make it possible for us to perform the job we love to appropriate standards. 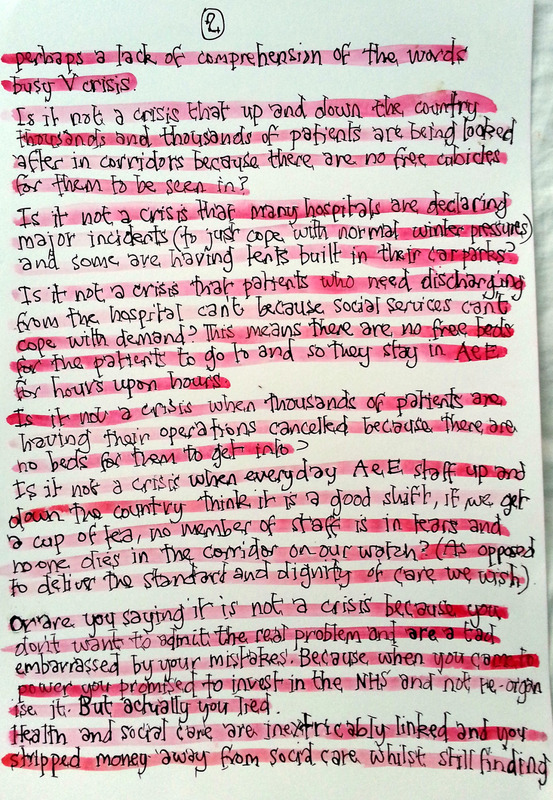 It may be hard for all of us who work in A&E, but it is nothing compared to what our patients have to endure. But amazingly it is them who keep us going - with humor and goodwill and not complaining about us despite everything going on, along with a diabetic inducing amount of chocolate being bought for us. Mr Hunt and Cameron - I also want to ask you why you think we are performing well? You say it is because around 85-95% of patients get seen and discharged or admitted within 4 hours ( still the worst figures since we started recording this data). But that hides the reality. It is easy to boost this percentage with easy patients with cuts and colds and minor injuries but what about the care for patients who are genuinely sick - the ones who need admission. How quickly to they get seen and admitted? That is the figure that should be made available but isn't. I don't know what the numbers are, but from recent experience from up and down the country, I doubt that at the moment half of patients who get admitted do so within 4 hours of when they arrive; remember delayed admission leads to worse outcomes. Please start releasing this important figure as it will give a much better barometer for how the NHS is doing. 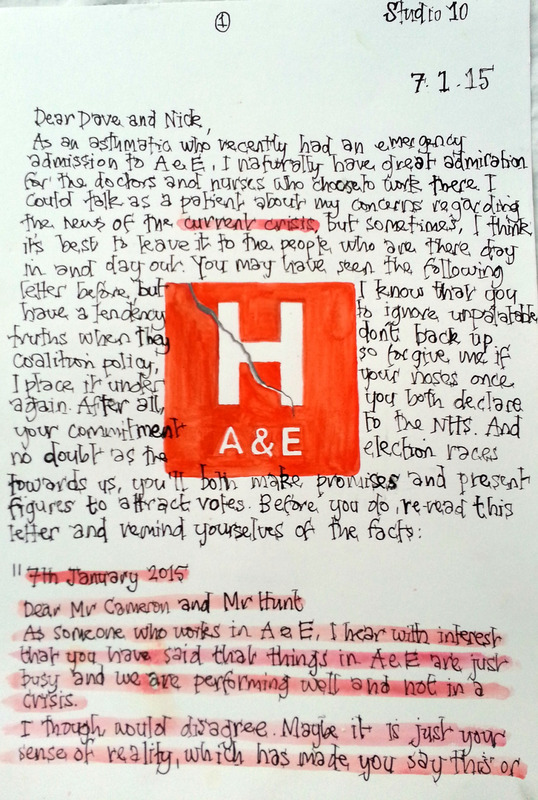 So Mr Hunt and Mr Cameron - come down to any A&E and see the crisis/'just busy' and when you do so, listen to the staff who can explain what needs to be done, as opposed to listen to your political advisers. In A&Es throughout the country, we are buckling under the strain and it is only because of everyone's hard work and dedication that patient care is being maintained to the extent it is and morale hasn't yet cracked. It feels that we in the NHS ( from porters, to managers, to nurses, to support staff, to paramedics, to hospital doctors and GPs) are lions being led by donkeys. We are facing 1930s public sector cuts driven by politicians with the mentality of World War One generals. So in summary - please Cameron and Hunt, stop thinking about your political ideology and start thinking about our patients, Remember the NHS was set up after World War Two during a period of unprecedented austerity - stop destroying it under the name of austerity. P.s. it must be quite easy going on question time and the likes debating fellow politicians and public figures who everyone knows have their own agenda. But the shop floor workers in the NHS have only one agenda - our patient care: so the debate may not be quite so easy with us, I would love to debate with you about the NHS crisis and offer some solutions. Are you up for it?" 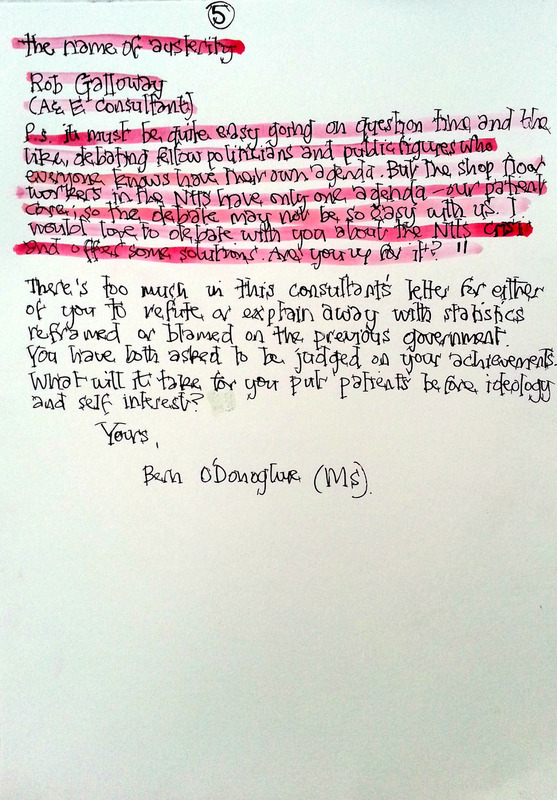 There's too much in this Consultant's letter to refute or explain away with statistics re-framed, or blamed on the previous government. You have both asked to be judged on your achievements. What will it take for you to put patients before ideology and self interest?